Put on your purple blazer and grab your protest sign, because March 8th is here, and you know what that means: It’s officially International Women’s Day. Since the very first celebration of the holiday in New York in 1909, women around the world have marked the occasion with parades and demonstrations that not only honor the trailblazers who came before them but also demand progress on behalf of those who will come after them. Thanks to the hard work of activists and organizations all over the world, International Women’s Day 2018 will continue that tradition. According to IWD’s official website, the theme for this year’s International Women’s Day is #PressForProgress. 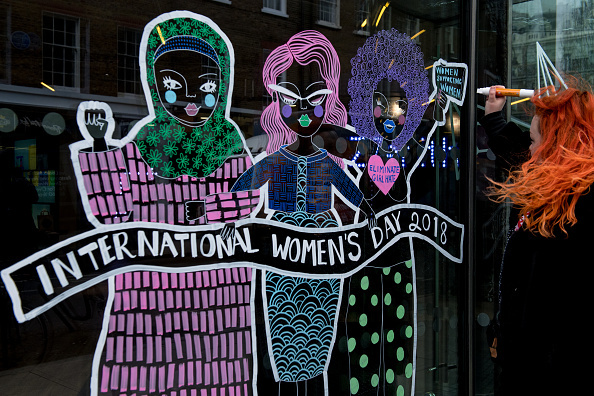 IWD organizers are asking women and their allies around the world to use whatever power and influence they have, no matter how big or small, to stand up on behalf of gender equality. "Now, more than ever, there's a strong call-to-action to press forward and progress gender parity," the IWD website says of this year's theme. "A strong call to #PressForProgress. A strong call to motivate and unite friends, colleagues and whole communities to think, act and be gender inclusive." International Women’s Day is more than just a global celebration of the accomplishments of women. It’s also an opportunity to get involved in the fight for gender equality, to demand progress, and to fight for a better future. You can help women around the world #PressForProgress by supporting one of these 9 incredible organizations in honor of International Women’s Day. Room to Read believes that to change the world, we must first start by changing the way we educate children. Every year, this organization invests in nearly one million children in low-income countries around the world by focusing on literacy and gender equality in education. In addition to the resources they provide primary school children, Room to Read is dedicated to helping young women complete secondary school with the skills they need to succeed beyond the classroom. Did you know that in India, poor families have to survive on as little as two dollars a day? Women on Wings is striving to change that by partnering with businesses to create one million jobs for women living in rural India. By creating economic opportunities for low-income women, the organization hopes to empower families to send their children to school, receive the nutrition and healthcare they need, and escape the endless cycle of poverty. A leading global women’s health organization, EngenderHealth changes the lives of women in nearly 20 countries through its work in family planning, maternal health, HIV and AIDS prevention, gender equality, and so much more. Their ultimate goal is to improve the life, health, and wellbeing of people living in the world’s poorest communities, and they do so by providing quality healthcare and advocacy where it matters most. Founded in 1993, Women for Women International has helped over 462,000 marginalized women around the world learn the valuable life, business, and vocational skills they need to survive and rebuild new lives in conflict and war-torn regions. They offer year-long programs that invite women to safe spaces where they can learn the skills they need to make money and become active participants in their communities. This International Women’s Day, they are asking people to express solidarity and support for women living in the most dangerous places in the world using the hashtag #MessageToMySister. Founded in 1987, Global Fund for Women fights for girls’ and women’s human rights all over the world. The goal of their global network of over 2,000 advisors and partners is to find, fund, and strengthen other groups who work with the world’s most marginalized and at-risk women. Over the last three decades, Global Fund for Women has invested in 5,000 women-led groups in 175 countries across the globe and helped millions of girls and women secure their rights to safety, health, and happiness. Did you know that every year, 12 million girls are married before they turn 18, and at least 650 million women today were married before they were legal adults? With help from over 400 organizations from over 60 countries, Girls Not Brides is fighting to put an end to the practice of child marriage and the threats against girls’ rights to health, education, and empowerment. Despite the fact that menstruation is a nearly universal experience for women, there is an ugly and dangerous stigma about periods that threatens the health of menstruating people around the world. Days for Girls is attempting to change that by increasing access to menstrual care and education in communities all across the globe. So far, their education, training, and hygiene kits have helped over one million girls. In honor of International Women’s Day, donations to the Days for Girls Shattering the Shame project in Nepal are being matched, meaning any donations today are twice as impactful. Nobel Peace Prize-winner Malala Yousafzai has been speaking out on behalf of girls’ education since she was 11 years old, and nothing, not even an assassination attempt by the Taliban at 15, has slowed her down. In 2013, Malala and her father founded the Malala Fund, which champions young women’s right to free, safe, and quality education for a minimum of 12 years. They focus on specific countries where girls are at high risk of missing out on educational opportunities, including Pakistan, Afghanistan, India, and Nigeria, as well as nations housing Syrian refugees, including Jordan, Lebanon, and Turkey. Happy #InternationalWomensDay! Let’s celebrate the incredible achievements of women across the world and work to empower tomorrow’s leaders. We all have a role to play in creating a gender equal and inclusive world! One of the official 2018 International Women’s Day charity partners, Catalyst is a leading nonprofit dedicated to the progress of women through workplace inclusion. In partnership with some of the world’s most powerful companies and CEOs, Catalyst strives to break down the barriers preventing women from accessing leadership roles at work by providing insightful research, practical tools, and proven solutions that help accelerate equality and progress. Whether you can donate a little bit of money or just a few hours of your time, these 9 organizations are on the frontlines fighting for women’s equality globally, and every ounce of support helps them do just that.